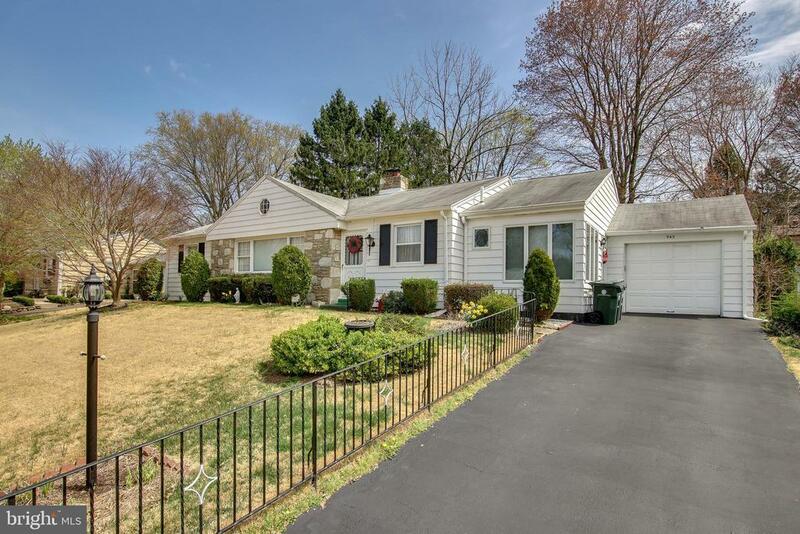 Charming one level home located in a must-see Wonderful Huntingdon Valley Neighborhood! Clean as a whistle, Move in Condition and Central Air! This Roomy Ranch style home comes with 3 nicely sized bedrooms, an Office, Family room, 1 full, 2 half baths and an Attached 1 Car Garage! The living room features a stone, wood burning fireplace, wall to wall carpet and a triple picture window allowing plenty of sunshine in; Adding additional space for family gatherings is the adjoining, nicely sized formal dining room which gives access to the large eat in kitchen offering a stainless steel sink, dishwasher, newer flat top oven, microwave, refrigerator., and the convenient laundry area with included washer and dryer; Just off the kitchen is the family room which offers a convenient powder room, access to the basement and to the garage; The carpeted master bedroom has an adjoining bath; There are 2 additional nicely sized bedrooms, bedroom 2 includes built-ins and an adjoining 9x8 office and bedroom 3 includes built in bookshelves. Enter the basement and crawl space just off the family room; Additional features: Pull down stairs to a floored attic, 200 amp service, roof replaced 2006; New driveway 2006; Heater 2004, Hardwood flooring under carpet! Seller is offering a 1 Year Home Warranty; Property being sold in. Central Vac. has not been checked! Great Location close to shopping and schools.